Around 2 years ago, we were asked by some friends if we would have room for a little white bantam out at our place. The story was, that over some months she had got really noisy and her owners were concerned that this noise was going to upset their neighbours, who lived nearby. Of course we said yes and that it wouldn’t be a problem and she came to live with the gang out here. From the moment Layla arrived we have had very little noise from her at all and the only noise we have got out of her is when she gets broody and decides to park herself on a nest full of eggs, which I may add, are unfertilised and so therefore will come to nothing anyway. She doesn’t have too many chicken friends around the farmyard, for whatever reason and spends most of her day with ducks, but she is a contented little soul. So, 2 weeks ago, after a gap of 2 years, we were asked once again if we could accommodate another little white bantam, from the same friends, for the same reason. We once again said yes. What was really interesting was that this new bantam Henrietta, was Laylas sister! Well, I can report that the big day came, they were reunited once again after 2 years and have been inseparable ever since and tootle around the farm in total silence too. Aren’t animals funny! This weekend we bid a short farewell to two of our cattle Lyndsey and Flora, who have gone off to have a party with a bull for a few weeks. Last year Monica and Lyndsey went off to a similar party but unfortunately it appears that Mr. Bull was a useless ornament and wasn’t in a partying mood at all and so neither of them had calves this year. Hopefully, things will go better this time, they will have a great time and 9 months down the road we’ll have the pitter patter of little ginger hooves around Long Meadow Farm, fingers crossed. After a few weeks of watching our visiting swallows teaching their young to catch their breakfast, it appears that the parents are already trying to do two jobs at once. It was only this week that I noticed whilst talking to the pigs one afternoon that the 3 sets of swallow parents were grafting away collecting mud from the pig pen, to patch up and make right any damage on their nests. Early the other morning, when I was supposed to be busy with more important things, I paused to watch 20 odd swallows congregate on the top edge of our barn. 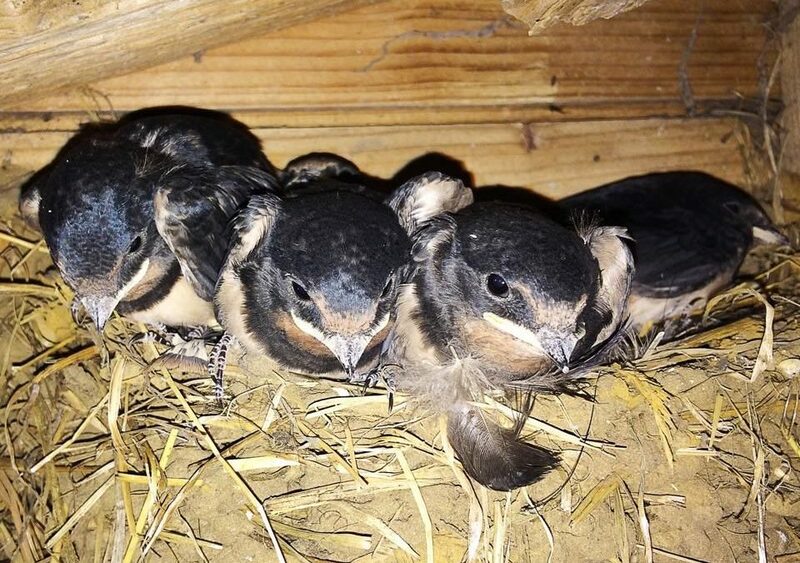 They are such beautiful little birds and to think that each year they have flown from South Africa, over the Sahara Desert and Morocco, then continued across eastern Spain, through western France and up the length of the country to nest in our stables. We are so lucky to be able to witness all this going on around us each day. Talking of travelling a long way, I have been very pleasantly surprised how far people have travelled to come and have a cuppa at the ‘Ginger Cow’. We have had folks from, Huddersfield, Wakefield, Leeds, Scarborough, Scunthorpe, Doncaster, Hull, York as well as many locals. We have even had a number of visitors from much further afield, Canada, the U.S.A and Australia who have been keeping track of our activities and whilst over on holiday have decided to come and pay us a visit and very welcome they are too!